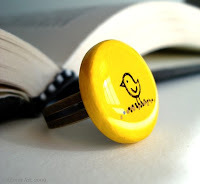 My Blog: You're a great CHICK! With Spring's arrival, I thought, why not celebrate some snappy Chicks! 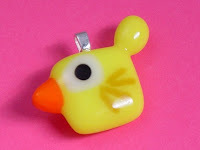 This little chick is a creation by, Art From The Heart. This is thebrickkiln's signature Itty-Bitty dish. Just a wonderful little Chick that loves you! 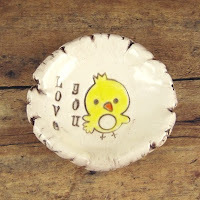 Check out this hand painted adjustable Chick ring! It's by AlloverArt and it just sings Spring. This is a wonderful piece of ACEO print by kellyjcallahan. I just love this print. Just so Joyful! And now, just a tiny bit of self promotion! 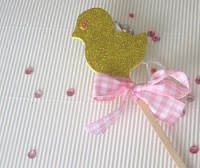 My little Chick on a Stick! You can just stick her anywhere! !